Who is this mysterious gray-furred, pale blue-skinned winged mouse? 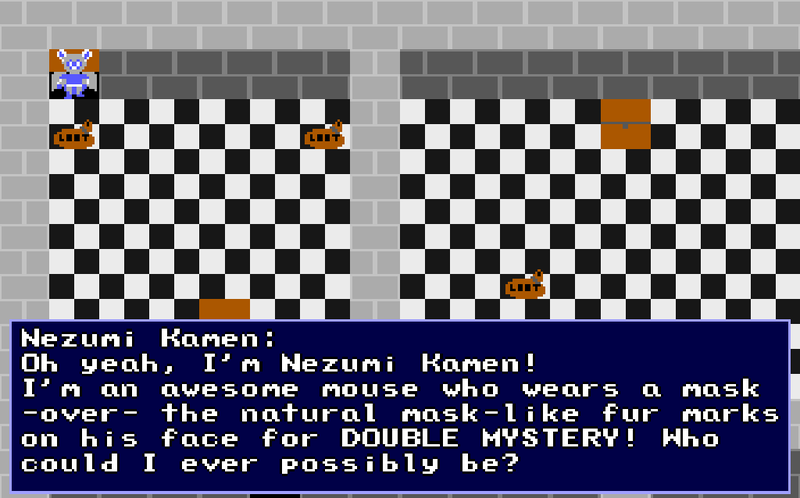 His true identity remains a secret, but in English you can call him Nezumi Kamen (and in Japanese you can call him Masked Mouser). The tamest interaction you'll have with the first boss...while it stays that way. If you thought No Eat pushed a line, this game crosses way past that with reckless abandon as if there are no boundaries. Yes, I've become many of the things I railed against twelve years ago when I was a kid fresh to the Internet; what's new? By the way, my birthday was Black Friday. I'm officially a wizard now. 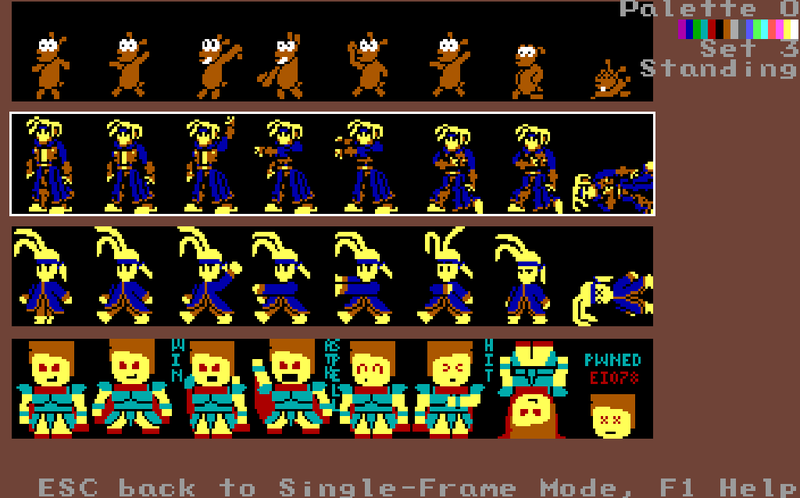 At first I was planning on just ripping Kyle's sprites from Fen's 8-bit game and ask for permission before releasing it, but they clashed stylistically with the rest of the game so I used them as reference points to draw my own (sillier) version.For Kyle's sprites, my thought process was "If Fenrir's version was an FF1 hero post class change, I want mine to be the version you'd have at the start of the game". 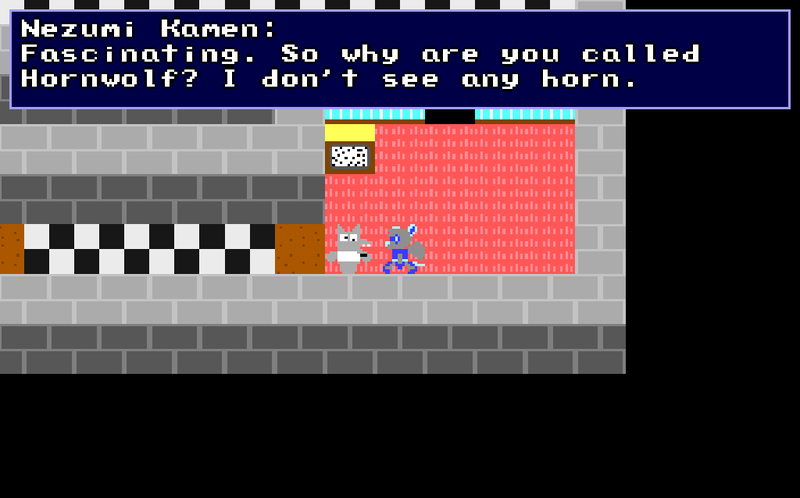 Recruiting other OHR heroes is a theme of this game. Kyle will be either very easy or very difficult to get depending on your approach to the first dungeon, and in said dungeon there's a monster he can do 208 damage to with his Genocide Blade attack just at his initial strength of 4 - ridiculous overkill for a monster with 5 speed and 6 HP. Those three blank spots in the spell list? Every weapon doubles as a character class, and a script writes the class's three spells to your spell list. The script wasn't exactly easy, and I probably wrote it in a very inelegant, brute force manner. However, it's far more scripting than I usually put into a game! The reason for this script is that I'm using the old level-up bug, and since I can assign a default, irremovable weapon but not other item slots I wanted to make sure characters wouldn't be without their Class and thus stat gains. Jack of All Trades +2 HP, +2 MP, +1 STR, +1 DEX, +1 TGH, +1 EVA, +1 INT, +1 WIL. Base attack is a boomerang, which attempts to steal on the return swing. 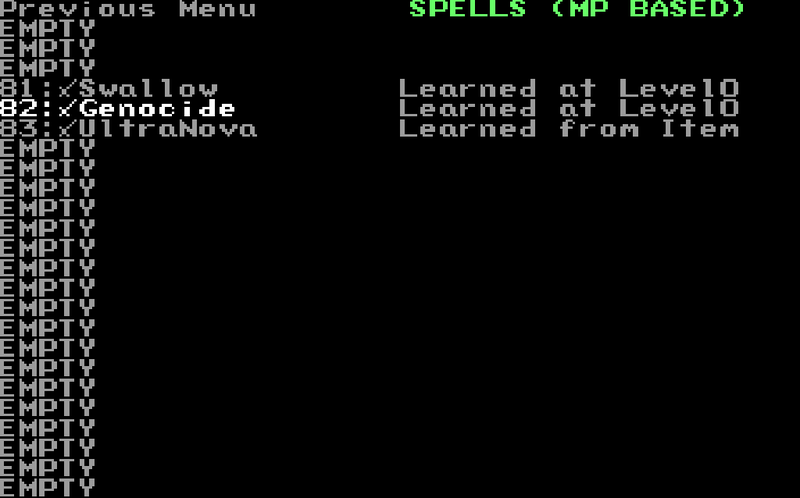 Spells are First Aid, Haste, and Jump. Warrior +4 HP, +0 MP, +2 STR, +2 DEX, +1 TGH, +1 EVA. Base attack is an axe, doing extra damage of both the Manslayer and Lawnmower types (for killing humanoids and plant monsters respectively). Spells are Chuck Axe, Berserk, and Defend. Pirate +3 HP, +1 MP, +2 STR, +1 DEX, +2 TGH, +1 EVA. Main attack is Mug, which steals an item and is Fishdrowner type, doing extra damage to sea creatures. Spells are Lookout, Seasick, and Rum. Ninja +1 HP, +3 MP, +1 STR, +2 DEX, +2 EVA, +1 INT. Main attack is Tatakau, which does Manslayer damage like the Warrior's axe. Spells are Throw Knife, Doku, and Naoyusimi. Crusader +2 HP, +2 MP, +1 STR, +2 TGH, +1 INT, +2 WIL. Main attack is Smite, which does Deathkiller damage (the same type as the Disrupt Undead spell, but without auto-failing against enemies who aren't weak to it). Spells are Life, Disrupt, and Have Faith. Wizard +1 HP, +3 MP, +1 DEX, +1 EVA, +2 INT, +2 WIL. Main attack is Missile, which does Flyswatter (bonus vs. aerial) and Rocksmasher (bonus vs. inanimate) damage. Spells are Fireball, Lightning, and Sleep. Martial Artist +1 HP, +1 STR, +1 DEX, +1 TGH, +1 EVA, +1 INT, +1 WIL, +1 HIT. Base attack is Low Kick, which does Rocksmasher damage and stuns enemies afterward. Spells are Surge Fist, Hurricane Kick, and Dragon Punch. Bard +1 HP, +3 MP, +1 STR, +1 DEX, +2 EVA, +2 INT. Main attack is Soundwave, which hits all enemies but divides spread damage, and is ROCK elemental. Spells are Rousing Song, Soothing Song, and Mystic Whisper. [size=small] Initially, Warrior and Berserker were going to be two different classes with different weapons and attacks, but I merged them when I remembered my plan to rely on Fnrrf's 8-bit graphics pack as much as I can. Then I realized how superfluous a Berserker was when I could just make that one spell for the Warrior. I've been considering making throwing hatchets and daggers just a function of the items and freeing up one more spell each for the Warrior, Rogue, and Ninja. Ninja is the only one I have a hard time thinking of something new for. I didn't have room for both an icon and the U.